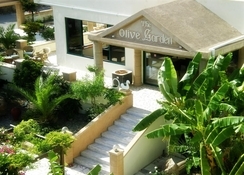 The Olive Garden Hotel Rhodes is a luxury family-friendly hotel in Lardos, Rhodes in Greece. The closest beach is just 700m away from the hotel complex. The property houses multiple outdoor swimming pools on its premises and some of them even have water slides. The architecture and interiors of the resort are minimalist and inspired by Greek motifs, featuring bright colours. The property houses 107 tastefully designed guestrooms equipped with all the amenities and facilities that ensure a luxurious stay and a fulfilling experience. 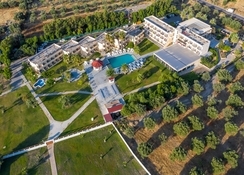 The hotel is located 1.8km away from the village of Lardos, giving the guests a unique opportunity to experience the country life in Greece. This is a great destination for couples, families or a group of friends looking for a memorable beach vacation in Greece. 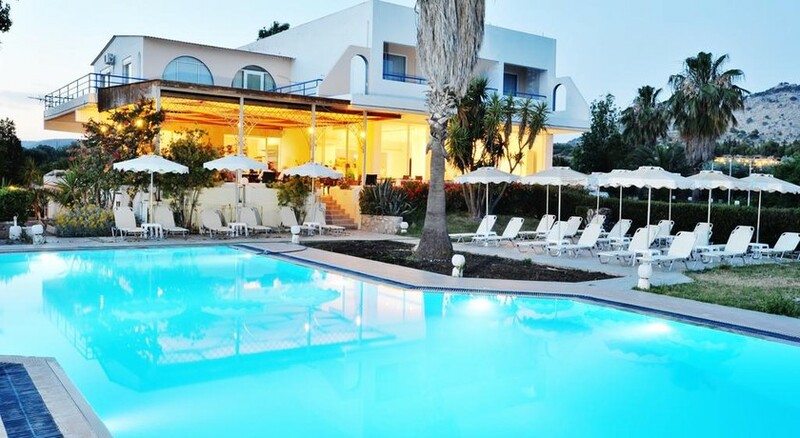 The Olive Garden Hotel Rhodes is located 51.4km away from the Rhodes International Airport. The nearest beach is 700m away from the property. The town of Lardos is at an accessible distance of 1.8km from the hotel, 10.8km from Lindos village and 49.6km away from the Rhodes city. The proximity of the hotel to the towns of Lardos and Lindos provides the guest with a unique opportunity of exploring numerous major tourist attractions across the towns. The Olive Garden Hotel Rhodes has 107 tastefully decorated guest rooms. The architecture and interiors of the rooms are minimalist and inspired by Greek motifs, featuring bright colours. All the guestrooms are categorised into three types: Standard Rooms, Deluxe Rooms and Superior Rooms. The rooms are equipped with hair dryer, shower, baby-cot, TV with satellite channels, private balcony, air conditioning, electronic safety deposit box, direct-dial telephone, tea and coffee maker, refrigerator, bed linens, bath linens, essential toiletries and personal care items. The Olive Garden Hotel Rhodes houses a restaurant and a bar that serve a wide range of international and local Greek Mediterranean cuisines. Apart from that, the bar also serves a variety of local wines, beers, signature cocktails, alcoholic and non-alcoholic beverages. For the guests’ ease, the hotel has an all-inclusive policy in place. The guests can also try local restaurants, traditional taverns and bars in Lindos and Lardos. The Olive Garden Hotel Rhodes houses multiple beautiful, large outdoor swimming pools, for both adults and children, which serve as an excellent option for recreational opportunities like pool games or refreshing dips. The hotel has a newly inaugurated water park with water slides, plunge pool and many excited features. The pool is surrounded by lounge chairs where the guests can relax and spend some quality time. While at the hotel, the guests can indulge in activities like tennis, hiking, table tennis, billiards, darts, beach volleyball, gaming, etc. The hotel also houses a spa and wellness centres, where the guests can get pampered. The guests can also try various water sports offered at the beach nearby. The beach is also a great spot for the guests to relax and spend some leisure quality time sunbathing. We wernt to sure if it was going to be any good never booked with teletext before and we had it really cheap but to be honest the best holiday so far. We arrived at 3 in the morning so everything was dark but when we woke up in the morning it was a shock such a amazing place everything was perfect from the staff to the weather to even the locals big shout out to the animation team and bar staff love you guys made the holiday a fantastic experience wish I could of stayed longer. Very nice and clean hotel. Fantastic food quality and very friendly staff. Is a good place for chill out young people and family. I recommended this hotel. Facilities were excellent and clean. Stay was really enjoyable and thes taff were friendly. Nice location and friendly staff, wide range of food to cater to all the nationalities there, was also well cooked but be aware the vegetable soup was made with chicken stock - very obvious. But the only issue we had was when the entertainment ran over by 2.5 hours, our last night when we had to be up early to leave. We went to the Olive Garden recently and had a wonderful holiday. The rooms are basic, but as you don't spend a great deal of time in there it doesn't really matter. It was clean and cool. The pool is lovely and the waterpark was great fun. There are lots of things for children - pool, play equipment and a section in the waterpark. The animation team are fantastic and work really hard to make everyone feel involved. The bar staff and restaurant team are smiley and helpful. The food is quite plain, but very tasty. The only complaint we had was that the hotel advertises a 'state of the art gym'. This is one reason I chose this hotel. Unfortunately, it is so state of the art, it isn't even completed yet and not open. My husband was very disappointed. Hence, we have rated the hotel as a 4 instead of a 5. There are no pool towels on offer, so be sure to take your own! The soft drinks were a bit awful - the machine used soda water instead of lemonade so cola, orange, lemon, etc. tasted strange. Never mind - the cocktails were delicious!! Nice family get away. Food was very repetative. Rooms were ok, no shower door so everything got wet in the bathroom. Pool slide broke during our stay. I stayed at the Olive Garden for 1 week with my partner. The journey from the airport to the hotel was the longest. Upon arrival into the apartments, I noticed the toilet was not very clean and there were stains on clean linens. Ants are a huge problem in the rooms and you would often have ridiculous amounts that you had to deal with. The room was tiny compared to what is advertised. The rep was hard to get a hold of. The food was disgusting and had no range of options. The chef was rude and refused to make more food even if it was an hour and a half before the end. Ants were crawling on the bread in the morning at breakfast. I struggled to eat whilst there. Some of the deserts were okay. For the amount of people that stay there, the restaurant and variety/amount of food is way to small. The hotel shop quality was terrible compared to other similar rated hotels. Also, do not bother staying here if you like sightseeing because there is nothing much to do. If you like to do activities you have to travel at least 30 mins and if you like water parks, you can enjoy the 2hr non-air conditioned bus journey. One of the only positives that the entertainment team are lovely and so are the bar staff. Baklava's are also an amazing desert they served at the Olive Garden. Overall, a very unsatisying experience for price.